Shrove Tuesday is just around the corner again – a perfect excuse to have a pancake party – what fun that is…. The tiny tots love it, teens have fun and the ‘wrinkles’ reminisce about pancakes in the past. So where did the custom come from? The name Shrove Tuesday originally came from the word Shrive meaning to absolve. Christians were encouraged to examine their conscience, confess and repent before the penitential season of lent commenced on Ash Wednesday. Fasting was an integral part of Lent so it became a custom to use up all the sugar, butter, flour and eggs before the long period of fast and abstinence began. In Denmark and Norway the day is called Fastelavn, children dress up in costumes and gather treats. Iceland calls it Sprengidagur – Bursting Day and is marked by the tradition of eating peas and salted meat. In Sweden Fettisdagen – Fat Tuesday is celebrated by eating a marzipan filled pastry called semla. The Lithuanian’s celebrate the day called Užgavènês by eating pancakes or a special type of doughnut and then of course there’s Mardi Gras in New Oreleans which again means Fat Tuesday and on it goes. There are pancake races and pancake flipping competitions in many countries so let’s get in on the act. I love the simple pancakes of my childhood which my own grandchildren also love to help to cook and flip but here are some other recipes to choose from if you’d like to ring the changes before you consider 40 days of abstinence! Brunch, more substantial than a breakfast is the perfect meal for enjoying quality time with family and friends and enjoying hassle-free entertaining. 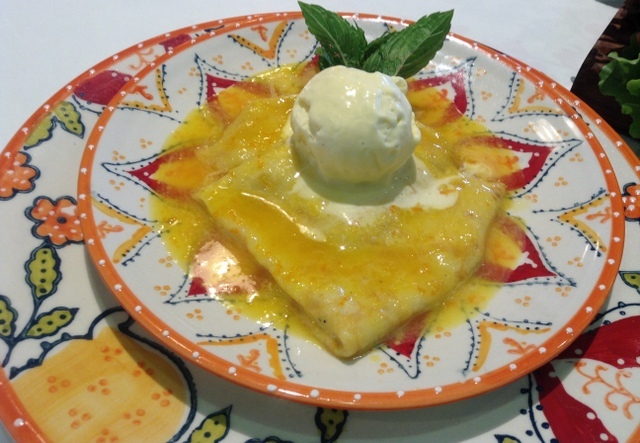 This crêpe recipe is very nearly as good as those Crêpes Suzette they used to serve with a great flourish in posh restaurants when I was a child. These crêpes are half the bother and can be made for a fraction of the cost. Sieve the flour, salt, and sugar into a bowl, make a well in the centre and drop in the lightly beaten eggs. With a whisk or wooden spoon, starting in the centre, mix the egg and gradually bring in the flour. Add the liquid slowly and beat until the batter is covered with bubbles. (If they are to be served with sugar and lemon juice, stir in an extra tablespoon of castor sugar and the finely grated rind of half a lemon). Next make the orange butter. Cream the butter with the finely grated orange rind. Then add the sifted icing sugar and beat until fluffy. Make the crêpes in the usual way. Heat the pan to very hot, pour in just enough batter to cover the base of the pan thinly. * A small ladel can also be very useful for this, loosen the crêpes around the edge, flip over with a spatula or thin egg slice, cook for a second or two on the other side, and slide off the pan onto a plate. The crêpes may be stacked on top of each other and peeled apart later. They will keep in the fridge for several days and also freeze perfectly. If they are to be frozen it’s probably a good idea to put a disc of silicone paper between each for extra safety. Note: If you have several pans it is perfectly possible to keep 3 or 4 pans going in rotation. Only necessary if you need to feed the multitudes. Melt a blob of the orange butter in the pan, add some freshly squeezed orange juice and toss the pancakes in the foaming butter. Fold in half and then in quarters (fan shapes). Serve 2 or 3 per person on warm plates. Spoon the buttery orange juices over the top. Repeat until all the pancakes and butter have been used. Note: A tablespoon (1 American tablespoon + 1 teaspoon) of orange liqueur eg. Grand Marnier or Orange Curacao is very good added to the orange butter if you are feeling very extravagant! Spread a little chocolate spread (Green and Blacks) in the middle of the crêpe, top with a blob of cream and sprinkle with chopped toasted hazelnuts. Spread a little chocolate spread (Green and Blacks) over each crêpe. Top with a little kumquat compote (see recipe). Fold in half and then in quarters (fan shapes). Serve with softly whipped cream. Mix the mascarpone with the honey, add the freshly squeezed lemon juice and mix to combine. Spread a layer on a warm crêpe. Drizzle some kumquat marmalade or kumquat compote over the top. Fold or roll up and enjoy. Alternatively serve bowls of mascarpone, maple syrup and kumquat marmalade or compote with the hot crêpes so guests can assemble themselves. A gem of a recipe, this compôte can be served as a dessert or as an accompaniment to roast duck, goose or glazed ham. Also delicious with goat’s cheese or yoghurt. Slice the kumquats into four or five round depending on size, remove the seeds. Put the kumquats into a saucepan with the water and sugar and let them cook very gently, covered, for half an hour or until tender. Note: This compote keeps for weeks in the fridge. Julija Makejeva, who works with us at the Cookery School, taught me how to make these pancakes, known as oladushki in Russian. Put the buttermilk into a bowl, sprinkle the bicarbonate of soda on top and leave for 3–4 minutes to allow the mixture to bubble. Whisk the egg, salt and caster sugar into the buttermilk mixture. Slowly add the flour to the batter, whisking all the time, until the mixture has an even consistency. The batter should be very thick and reluctantly fall off the spoon. Heat a wide frying pan on a medium heat. Add the vegetable oil. Pour a tablespoon of batter into the pan and repeat – you should be able to fit about 5 more pancakes in the pan, spaced evenly apart. Fry until golden brown on one side, flip over once bubbles have appeared on the surface and popped. Repeat the process until all of the batter is used. 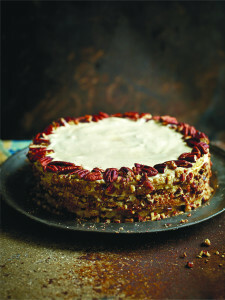 Serve with sour cream mixed with raspberry jam or sour cream sprinkled with brown sugar. If using mixer, set it up with the dough hook attachment. Melt the butter and add the milk, ensuring a lukewarm (blood) temperature. Add the fresh yeast and stir until dissolved. Add sugar and stir again. Add 300 g of flour as well as the salt, baking powder and ground cardamom. Add ½ the egg (preserve the other half for brushing before baking). Mix well until all ingredients are incorporated and then start to add remaining 100 g of the flour, bit by bit, until you have a dough that is only a little bit sticky. Take care not to add too much flour: you will get dry buns. Knead the dough for at least five minutes in the mixer, longer by hand. Leave to rise in a warm place until doubled in size, about 40 minutes. Turn the dough out to a floured surface. Knead again for a few minutes, adding more flour if needed. Cut the dough into 12 equal sized pieces. Take care that the balls are completely round and uniform in size. Place on baking tray with good spacing between buns. Leave to rise for another 40-50 minutes. Gently brush each bun with the remainder of the egg wash and bake in a hot oven for about 20 minutes or until baked through – keep an eye on them as they can burn quickly. Remove from oven and cover the tray with a lightly damp tea towel immediately – this will prevent the buns from forming a crust. When the buns have cooled down completely, cut a ‘lid’ off the buns – about 1½ cm from the top. Scoop out about ⅓ of the inside of the bun and place crumbs in a separate bowl. Mix the almond paste with the crumb until it forms a very sticky mass –add a dash of milk or custard at this point to help it along. You want a spoonable even mixture. Spoon the filling back into the buns, equally divided. Whip the cream with the vanilla sugar until stiff and use a piping bag to pipe cream on all the buns’ tops. Put the ‘lids’ back on and dust with icing sugar. Sieve the castor sugar and mix with the ground almonds. Beat the eggs, add the whiskey and 1 drop of pure almond essence, then add to the other ingredients and mix to a stiff paste. (You may not need all of the egg). Sprinkle the work top with icing sugar, turn out the almond paste and work lightly until smooth. This basic sauce is usually flavoured with vanilla but can be make with any number of other ingredients, such as lemon or orange rind or mint. It is used in many recipes including ice-cream, though in that case the proportion of sugar is much higher than usual because unsweetened cream is added during the freezing. Bring the milk almost to the boil with the vanilla pod. Beat the egg yolks with the sugar until thick and light. Whisk in half the hot milk and then whisk the mixture back into the remaining milk. Cook over very low heat, stirring constantly with a wooden spoon, until the custard thickens slightly. Your finger should leave a clear trail when drawn across the back of the spoon. Remove from the heat at once and strain. Cool, cover tightly and chill. The custard can be kept up to 2 days in the refrigerator. These Portuguese-style raised doughnuts are super-popular in Hawaii. Put 1 egg, sugar, butter and salt in bowl of heavy-duty mixer fitted with dough hook attachment; beat until blended, 1 minute. Add 5 cups flour and yeast; beat until blended. Add the hot water, milk and vanilla and beat until well blended, 1 minute. Beat in remaining 2 eggs, then 1/2 cup flour. Beat until dough is smooth, soft and slightly sticky but begins to come away from sides of bowl, adding more flour by tablespoonful if very sticky, about 8-10 minutes. Scrape down dough from sides of bowl. Cover bowl with plastic wrap and towel. Let dough rise in warm draft-free area until almost doubled in volume, about 1½-2 hours. Punch down dough. Cut into 2 equal pieces. Roll out 1 piece on lightly floured surface to 12×16-inch rectangle. Cut lengthwise into 3 strips and crosswise into 4 strips, making twelve 4-inch squares. Repeat with remaining dough. Pour enough oil into large saucepan to reach depth of 1 1/2 inches. Attach deep-fry thermometer and heat oil to 350°F. Fry 2 or 3 malasadas until puffed and golden brown, turning once, about 3 minutes. Using slotted spoon, transfer malasadas to paper towels and drain. Repeat frying with remaining dough squares, heating oil to 350°F for each batch. Generously sprinkle warm malasadas with additional sugar. Serve warm or at room temperature. Before the holidays every magazine, newspaper, food programme and TV ad was shamelessly luring us into temptation, encouraging us to over spend and over indulge in a myriad of different ways. It was hard to resist and of course many of us succumbed. Now the day of reckoning has come. It’s all about lean, keen and frugal, instead of tempting food supplements in newspapers, there are diet supplements each promising miracles. Slim and trim in 28 days….The five pound weight loss trick that works…How to lose weight and keep it off…..yeah, yeah, yeah…. How gullible are we, who ever checks the results? Cook books that promise to make you glow and make you beautiful, vaporize off the shelves as we clutch at straws. One super food after another rises and falls. At last there’s the beginnings of a backlash- after countless hopes have been raised and dashed, a badly needed note of scepticism is being introduced So could it really be that after all the false promises the answer is quite simply a balanced diet of fresh natural food in season and everything in moderation, how undramatic and boring does that sound – yet it is unquestionably true. I’ve never been on a diet in my life and I don’t intend to start now but there are some things I really do feel strongly about. Eat as much organic and naturally produced food as possible. In the words of George Orwell in 1937 when he wrote ‘The Road to Wigan Pier’, “we may find in the long run that tinned food/ processed food is a deadlier weapon than the machine gun”. Eliminate processed food entirely from our diets. We can no longer say we don’t know the damage they are doing to both our essential mental and physical health. Eat less meat but better quality and lots of unsprayed vegetables and fruit that have been grown in rich fertile soil not hydroponically. We need to reduce our sugar intake by at least 50% NOW. Nowadays, according to most recent research, 1 in 2 of us will suffer from some form of cancer. I was brought up with the understanding that food should be our medicine and that if we didn’t put effort into the food on the table we’d give it to the doctor or chemist. How true is that – of course we are all insanely busy but there are few things more important than the quality of the food we put on the table. I’m not talking fancy – I’m just talking real simple food that comforts and nourishes. We have got to take back control of our food choices from the multinational corporations who can’t be expected to have our best interests at heart. Their sole concern is to make the maximum profit for their shareholders, not our personal health. So dump all those breakfast cereals and go back to porridge, ban all fizzy drinks and rediscover water. 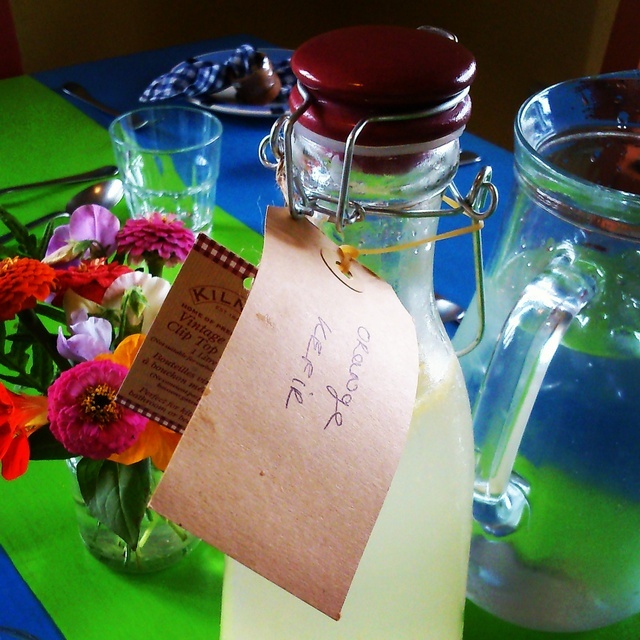 We used to have homemade lemonade everyday on our lunch tables here at the school but now it’s water kefir – a simple fermented drink that can be flavoured with anything from lemon to loganberries and lots of fresh herbs. It’s exceedingly good for your gut flora and the students love it. We’ve got to reintroduce cooking classes back into the school curriculum from ‘baby infants’ upwards. It could single-handedly help to change our eating habits and up skill the next generations in such a way that they can take back control of what they eat. On Saturday January 30th, Mrs Cowhig and Hannah Conroy will pass on the traditions and give a lesson on how to make a St Brigid’s Cross at the Midleton Farmers Market from 11am-12pm. Philip Dennhardt is our resident master butcher at the Ballymaloe Cookery School and on Saturday January 29th 2016 from 2pm-5pm, Philip will teach the skills needed to butcher a whole lamb into your favourite pieces. Course includes half a lamb which you help butcher and then take home for the freezer, so make sure there is room. We’ve known and admired Mary Jo for many years. She has a cult following in the US and is particularly famous for her braises and slow cooked dishes and of course her baking. On Saturday January 30th, 2.00pm-5.30pm, Mary Jo will teach two fool proof menus and the secrets of several of her sought after cakes, pastries and French bread. This course was inspired by a conversation Mary Jo had with one of our 12 Week Certificate students who couldn’t leave the day job because of financial commitments, In her uniquely generous way, Mary Jo will advise on how to scale up recipes for larger numbers and set up a catering business from home for the many aspiring chefs who may be searching for a way to have a part time career in food. With Water Kefir you can turn sugared water into one of the most vibrant, probiotic-rich drinks you can make at home! 4 unsulphered dried apricots or other dried fruit. It is important not to use any metal utensils or brewing vessels while making Water Kefir. Stir the sugar into approximately 250ml (9fl oz/generous 1 cup) of hot water until it dissolves, then add remainder of cold water and allow it to cool to room temperature. Place the water kefir grains into a 1 litre jar, pour in the cooled sugar water, and drop in the dried fruit. Cover the jar loosely with a lid, or with a cloth secured with a rubber band to allow air in but to prevent stray debris from spoiling your water kefir. 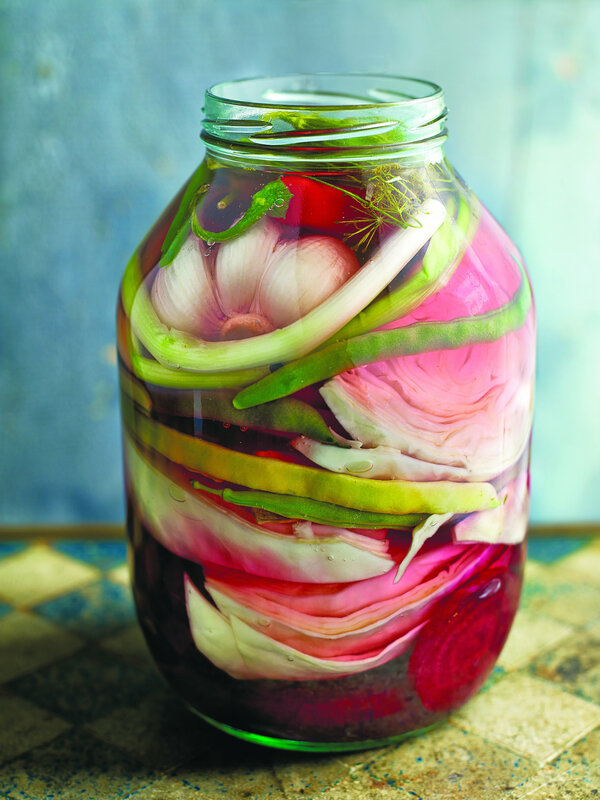 Allow the water kefir to ferment for 2 to 3 days. The longer it ferments, the drier and less sweet it will become. When the water kefir acquires a flavor that suits you, strain it using a plastic strainer into a jug. Discard the dried fruit (or eat it) but reserve the water kefir grains which can be immediately reused or stored. While the water kefir can be enjoyed as it is, after its initial fermentation, you can also ferment it a second time. Secondary fermentation allows you to flavor the water kefir, and the secondary fermentation process, which occurs in a tightly capped bottle allows carbon dioxide to develop, producing a fizzy water kefir. After transferring you water kefir into a bottle add a handful of one of the following to your taste. 5 – 6 small pieces of Crystallised Ginger. Leave to ferment for another 12 – 24 hours with a lid on. It’s a good idea to release pressure every so often particularly if your kitchen is warm as secondary ferments have been known to explode! Keep tasting to understand when your ferment is ready to your liking. Water Kefir grains are alive being a Scoby (Symbiotic colony of bacteria and yeasts) and therefore require looking after to ensure they produce the best kefir for you. Occasionally it is beneficial to give your grains a mineral feed. Nutrition: Jerusalem Artichokes are a very important source of inulin which enhances the growth of beneficial bacteria in our systems. Particularly essential after a course of antibiotics. 600ml (1 pint/2 1/2 cups) creamy milk approx. Mix the Balsamic or sherry vinegar, mustard, shallots, salt and pepper. Whisk in the olive oil until emulsified. Slice the persimmons and pears into slices about ¼ inch thick. Put into a medium bowl and sprinkle with freshly squeezed lime juice. Add the pomegranate seeds. Toss gently. Wash and dry the greens, store in a clean towel in the fridge until ready to use. Put the nuts onto a baking sheet in a moderate oven for 5 -6 minutes, tossing gently from time to time. Alternatively toast under a grill. Toss the greens in some of the vinaigrette and arrange on eight plates. Toss the fruit mixture lightly in the remaining vinaigrette. Arrange on top of the greens and sprinkle with the toasted pecans. Serve immediately. This was one of our favourites, we raced home from school for lunch even faster when we knew Mummy was cooking a steamed jam pudding, a warm and comforting winter pudding. Cream the butter, add the caster sugar and beat until white and creamy. Whisk the eggs with the vanilla essence and beat, a little at a time, into the creamed mixture. Stir in the flour and baking powder and add a little milk or water if necessary to make a dropping consistency. Grease your pudding bowl. Spread raspberry jam over the bottom and sides. Carefully spoon the cake mixture into the bowl. Cover with pleated greaseproof paper, tied on firmly, and steam the pudding for about 1½ hours. Meanwhile, make the raspberry jam sauce. Heat the jam with the water, add the lemon rind and juice and sweeten with a little extra sugar if necessary. Turn the pudding on to a hot dish and serve with the sauce and lots of softly whipped cream. I’m sitting on the balcony of the View Point Hotel in Nyaungshwe overlooking the jetty where most of the skiffs and narrow timber boats leave for Inle Lake, one of Myanmar’s biggest attractions. It’s really chilly at this time of the day. There’s two-way traffic: some boats, laden down with tomatoes, aubergines and gourds in huge bamboo baskets are on their way to the Mingalar Market in front of the pagoda. Farmers and their families sit, hunched up on the floor of the boats in woolly caps or hoodies. Up here, in the Shan Valley away from Yangon, virtually all the men still wear the lungi, a piece of cloth, worn sarong style, like a skirt. Other slender wooden canoes fitted with long tail outboard motors have a row of little timber chairs to take tourists out onto the Inle lake. It’s 22 kilometres long and about 11 kilometres wide, bordered by the Shan mountains on either side and numerous small villages. This watery world is home to the Intha people who live in stilt houses in villages that create a fringe around the lake. They grow fruit and vegetables in floating gardens anchored to the lake bed with bamboo poles and fish with traditional Intha conical nets using a distinctive leg rowing stance on timber skiffs – fascinating to observe. Since the 18th century, the Intha people’s way of life has gradually adapted to the climate and ecosystem. It is noisy here by the bridge with the put-put of the long tail motor engines that spew out a sheet of spray behind. To the right, motorbikes, tricycles, lorries and cars and an occasional horse drawn wagon, clip clop over the bridge on the way to the main street. School girls with long plaits on their way to class. The Buddhist monks walk through the town with their bowls collecting food and alms at dawn, wandering towards the monasteries and pagodas of which there are many in this small town, which is now the principal hub for Inle lake. I love the markets and local shops, they tell you much more about the food and culture and way of life than any guide book. I took a tricycle down to the Mingalar Market close to the entrance of the town. Both men and women stall holders sit squat – legged on raised platforms with their goods and produce beautifully displayed in front of them, up off the mud floor sometimes on rice or jute sacks or on bamboo or reed matting. We bought rice cooked in bamboo, little red rice cakes stuffed with bean paste and some crispy ants but I stopped short of trying a barbequed rice-paddi rat despite the guide’s assurance of how delicious they were with a beer or glass of rum toddy. Little old ladies dispensed medicinal advice on how to use the herbs and roots they were selling. Bright plastic and stainless steel are fast replacing tin and stainless steel cooking utensils. Nonetheless, there are still wonderful handmade clay pots that keep the water cool and fresh. The area is also famous for handmade knives and kitchen utensils, I also couldn’t resist some of the light wok and handmade watering cans – try to get to Burma soon, it’s fascinating, beautiful and changing fast. Where do I find carrageen moss? Well I found some beautiful local carrageen recently at the Village Greengrocer in Castlemartyr. I also saw several bags of the moss on the Olive Stall in the English Market in Cork City. Such a joy to see that this precious and health giving traditional food is still available. See www.cookingisfun.ie for recipe for Carrageen Moss pudding. 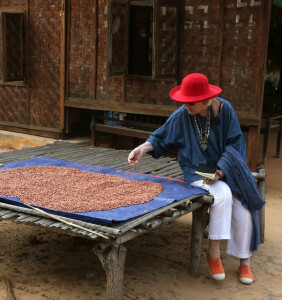 For me the BBC Radio 4 Food programme is unmissable, if you don’t manage to catch it on Sunday at 12.32pm or Monday at 15.30pm, listen back to the pod cast. Both Seville and blood oranges are now in the shops, so check out www.slowfoodireland website for some great marmalade recipes. Wednesday January 27th 2016, 7pm at the Ballymaloe Cookery School. Have a fun night and support Ballycotton RNLI Lifeboat who will host a fundraising dinner on Friday February 5th 2016 at Ballymaloe House. Drinks Reception at 7.30pm followed by dinner at 8. Cut the chicken breast into 1 inch (2.5cm) pieces and put into a bowl. Sprinkle with ½-1 teaspoon of turmeric, chilli powder, fish sauce and vegetable oil. Season well with salt and freshly ground pepper. Toss and massage the meat with your fingers and allow to marinade for 30-35 minutes or while the remainder of the ingredients are prepared. Put 4 tablespoons of oil in a wide wok or sauté pan, add the chopped red onion and cook for 2-3 minutes. Add 1 teaspoon turmeric, ½-1 teaspoon chilli powder, then add the crushed green cardamoms. Add the finely chopped ginger, sliced lemongrass and garlic. 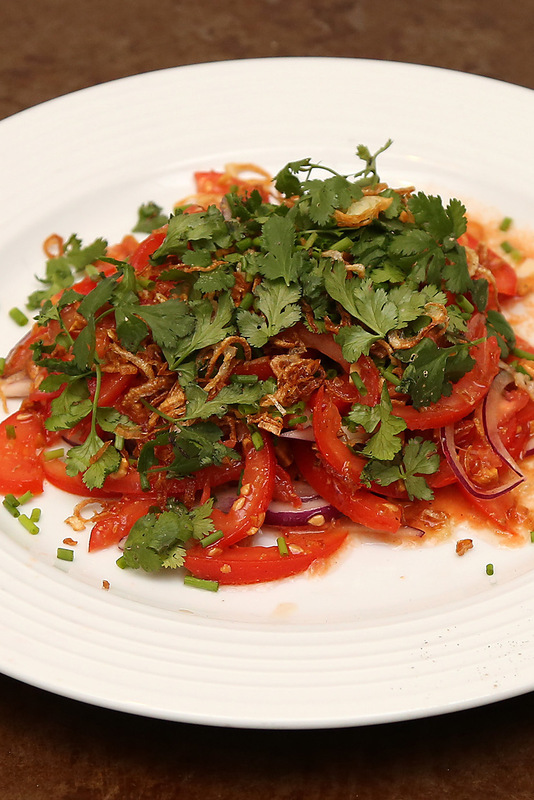 Stir and add 1 tablespoon of fish sauce and the diced tomatoes. Stir and cook for 3-4 minutes. Add the chicken cubes, toss, pour in the chicken stock and add 4 pieces of lemongrass. Add 2 tablespoons of tamarind water (if available). Simmer gently for 6-8 minutes more or until the chicken is fully cooked and sauce is balanced and delicious but still fresh tasting. Taste and correct the seasoning. Transfer to a warm serving dish. Sprinkle with fresh coriander. Serve with sticky rice or Basmati rice. Note, if tamarind water is not available, taste and sharpen with some freshly squeezed lemon or lime juice. Push the tamarind pulp through a strainer, with your clean fingers. Keep pressing until just the fibre and seeds are left in the sieve. Scrape all the pulp from the outside of the sieve. Use extra water, if necessary, to separate the pulp from the fibres. Discard the seeds and fibre. The Burmese include 1/3 teaspoon of ‘chicken seasoning’ which I prefer to omit. To make the toasted garlic oil. Finely chop the garlic, put in a small saucepan with the olive oil. Put on a low medium heat for 4-5 minutes and cook until the garlic is light and golden brown. If the garlic gets too dark both the garlic and oil will be too bitter. Just before serving, half the tomatoes. Thinly slice the tomatoes sideways into julienne. Sprinkle with 1 teaspoon of fish sauce, 2 teaspoons toasted garlic oil, crushed peanuts, thinly sliced red onion and half the crispy shallots. Squeeze the juice from one cheek of lime, toss well. Season with salt and freshly ground pepper. Taste and correct the seasoning. Pile onto a plate, garnish with fresh coriander, chopped chives and the remainder of the crispy shallots. Serve ASAP. The direct translation of this dish is cooked oil noodles, but I tend to associate it with the night market in Rangoon because this was the place where my brother and I often went to eat a bowl of these noodles tossed in garlic oil. It usually came with some shredded meat and a bowl of hot chicken soup sprinkled with spring onions. Nowadays whenever I have leftover roast meat, I rustle up these noodles which go down really well. Bring a large pan of water to the boil. Add a pinch of salt and blanch the noodles for a couple of minutes until they are soft. Drain and rinse under cold water. If you are using dried egg noodles, follow the packet instructions. Heat the oil in a wok and fry the garlic until golden. Remove from the oil immediately and drain on kitchen paper. Add the noodles and soy sauce, and then toss for a minute until the noodles are warmed through and coated with the garlic oil. Check for seasoning and sprinkle with crispy garlic and spring onions. Serve with shredded meat and a bowl of soup. This is a sweet crispy stick golden pancake that reminds me of brandy snaps. The pancakes are extremely soft and sticky during cooking and transform into chewy caramelised discs when they are cool. Put both flours in a mixing bowl; mix in the water to form a thick batter. Leave to rest for 20 minutes while preparing the sugar. If you are using palm sugar, grate it before placing in a small saucepan. Add 4 tablespoons of water and over a moderate heat stir until the sugar has completely dissolved. Remove from the heat and allow the sugar to cool. Gradually pour the sugar into the batter to form a consistency similar to single cream. When you are ready to fry the pancakes, heat enough oil to shallow fry in a small non stick frying pan. Spoon a small ladle of batter into the oil and swirl the batter into the pan to form a circular shape. Leave the pancake over a moderate heat until the edges are golden brown, then carefully flip over and cook the other side. When it is golden brown on both sides, remove from the heat and cool on a plate. The pancake remains soft and sticky until it is cool. Repeat this process making one pancake at a time until all the batter is used up, replenishing the oil when necessary.